The only reason this road is less travelled is that it has just opened. 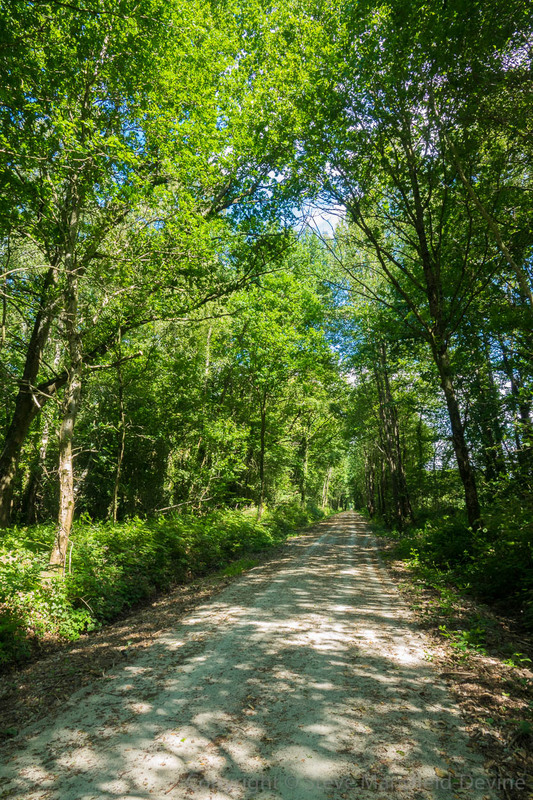 And it’s not a road – it’s a voie verte. A little while ago I wrote about how we’d discovered a new greenway on our doorstep (here and here). 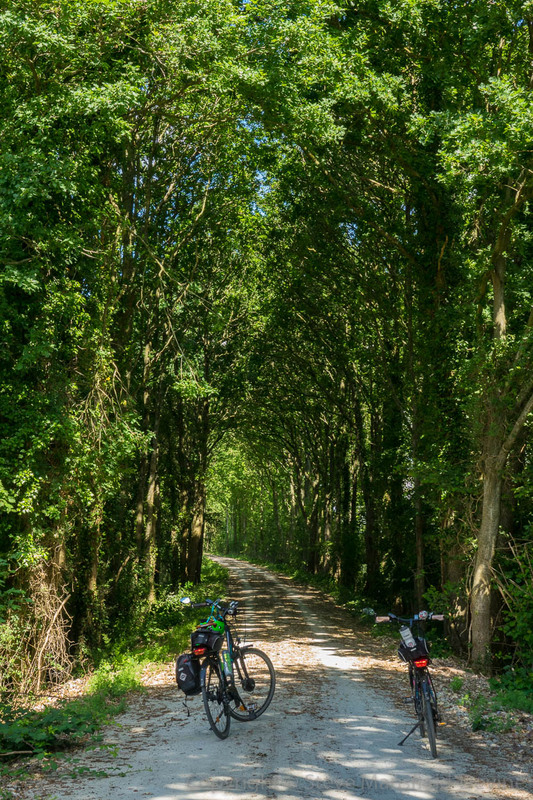 It’s a part of the Vélo Francette and links existing sections that run from Flers south to Domfront in the Orne department of Normandy and Ambrières south to Mayenne and Laval in the Mayenne department of Les Pays de la Loire. It’s not yet a complete link. There’s still a section at the southern tip of the new voie verte where you need to switch to roads for a while. But a look at the map suggests that this may, one day, be filled. The best thing about the new section from our point of view is that it’s within cycling range of our house. When we first discovered the new track we walked some of its sections, most of which were still rough – some bits newly hewn from the brambles, others just farm tracks. Every time we passed by in the car, we’d eagerly look to see what progress had been made. It was exciting when we saw that the surface had been finished. For various reasons, which included a sickly bike, I hadn’t had a chance to cycle it. Trish had done it a couple of times. But my time finally came a few days ago. We headed off from home on our bikes and were soon at the southern end of the track, near Ceaucé. My bike computer told me it was 12km from home. There are still gates across the end of the greenway, but we presumed these are to stop people driving cars down it. Soon they’ll be replaced by the standard wooden barriers. One of the delights of this voie verte is the amount of woodland you pass through. And even where it’s not actual woodland, they’ve left plenty of trees along the borders. It’s quite diverse too – cherries, oaks, silver birch and … well, my tree-spotting skills aren’t that good but even I can tell there’s lots of variety. While the voie verte is brand new, already there’s a fair amount of leaf litter and general tree detritus on it. None of it posed a hazard to cycling, but it looks like this is one route that’s going to require serious maintenance. The track itself, however, is pretty wide – easily broad enough to get a tractor down it for that maintenance work. At one point we were rather puzzled by a shape on the ground in the distance. When we got close, we realised it was a rather novel solution to the problem of a rusting bridge. They’ve left the rusty old steel plates and you can still walk or cycle across them. One assumes the new centre section is deemed to be safer. Somehow this seems a very French solution: there’s a safe section and a dodgy section, but we’re not going to tell you which one to take. That’s your choice. If you make a bad decision … well, tant pis. The stonework has been nicely repointed but the metal railings have been left in all their rusty glory. One disappointment is a section of infrastructure that has disappeared. We thought they were going to leave this section of track as a memento. It’s sad to see it gone, but it makes sense in terms of the road layout. I have a feeling we’re going to be riding this voie verte a lot.